Chess is arguably our greatest strategy game. More books have been written about than for all other games combined. Chess has enriched our language with words like checkmate, stalemate, opening phase, end game, and gambit. 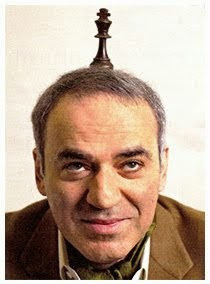 Gary Kasparov, the greatest chess player of them all, is the exception to the chess eccentric rule. Kasparov is happily married, and a successful entrepreneur and author. “What makes a champion?” Kasparov asks. His answer: Frequent, frank, even ruthless, reflection and self-assessment. Think of elite performers like Steve Jobs, Jack Welch, Michael Jordan, Jack Nicklaus, Tiger Woods (pre-implosion), Yoyo Ma, and Yitzhak Perlman. We see the same pattern, no? The Lean Business System is about elite performance. It's best practitioners ruthlessly self-assess, and adjust based on what they see. At Lean Pathways we call it Four-Step-Problem-Solving, which we teach through on site coaching, books [Pascal’s Amazon page] and other teaching aids [Brain Booster Pocket Cards]. But it's all about reflection - the Breakfast of Champions.